Watch our Earth Day launch video here! Just click the above image. On Earth Day 2018, Boulder-based Khala Cloths, winner of the 2017 Esprit Venture Challenge by the Boulder Chamber of Commerce, launched an entirely plant-based version of its popular zero waste wrap for food storage. Instead of using beeswax as a main ingredient to produce a washable, reusable, and biodegradable alternative to plastic wrap and bags, Khala Cloths’ new wraps use a blend of six plant-based waxes and oils to produce a food storage wrap now accessible to customers who had been asking for a non-beeswax version for years. "Since Day One of our company, people have been asking us if we have a vegan version of our wraps,” shares Asa McKee, co-founder and co-CEO of Khala Cloths. “After two years of perfecting our recipe and product testing, we are pleased to say that we’ve done it – and just in time for Earth Day!" This vegan version of Khala Cloths still follows the company’s founding commitment of sourcing only the most natural, organic, and ethically sourced materials, including non-GMO sunflower oil from Colorado Proud companies. Additionally, proceeds from vegan wrap sales will go towards Khala Cloths’ giving program with 1% for the Planet, of which the company is a member and just attended the Global Summit held in Boulder over Earth Week 2018. Known for collaborating with artists and non-profits to design unique prints for their wraps, the design for the vegan Khala Cloth print came from hand-painted sunflowers by Tamar McKee, also co-founder and co-CEO of the company. 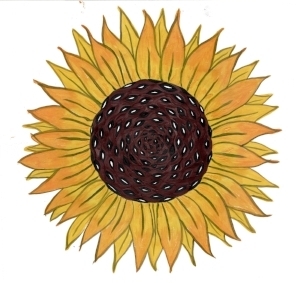 Tamar’s grandmother was originally from Kansas, whose state flower is the sunflower. Her grandmother spent her last days admiring the sunflowers Tamar had painted for her and hung on her bedroom wall – the same sunflowers that now adorn Khala Cloths’ new wraps. So whether consumers are looking for an alternative to beeswax-based reusable food wraps, or love their beeswax wraps but want to try something new, look no further than the brilliant yellow and red sunflowers of Khala Cloths’ vegan wraps – the first of its kind in North America. Available online at http://www.khalacloths.com/wax-wraps/ ($12-20) or at various stores around the U.S. (email to inquire: info(at)khalacloths.com).